In the aftermath of the 2003 invasion of Iraq there was quite a bit of confused fighting that carried on for a period. 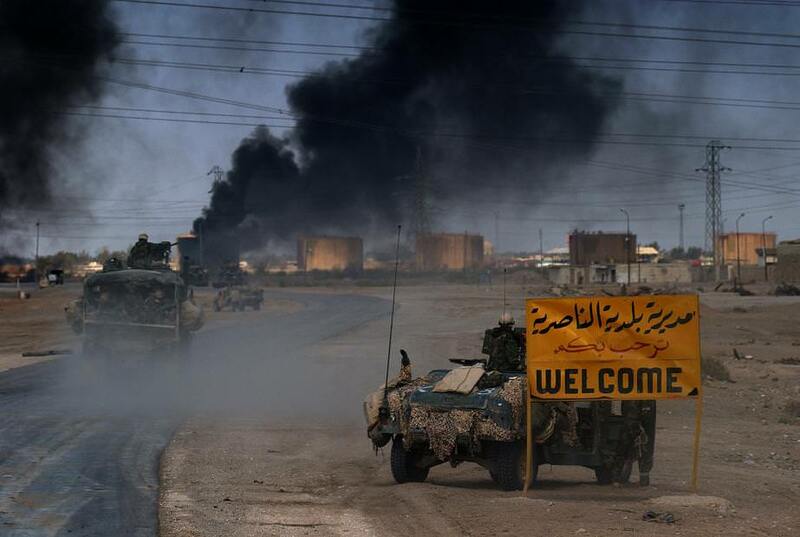 A prime example of this was in the north of the country, where during the war the US 173rd Airborne Brigade was landed and fought several actions with local Kurdish forces, resulting in the capture of Kirkuk. 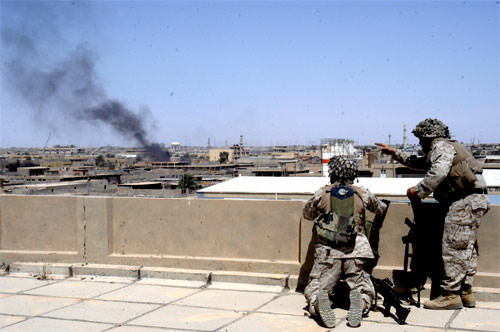 In the weeks after the war the US brigade concentrated in Kirkuk to ensure the city’s security, and move it towards a stable elected form of government. However due to lack of man power this meant the surrounding areas were without policing, and so became safe havens for Ba'ath party and Sunni Muslims dedicated to the old regime. This included members of the armed forces that were now part of the growing insurgent movements. You, on the right, what are you doing with that rifle? Towards the end of May 2003, the US forces began to draw up plans to deal with these outlying areas, the US forces planned to launch an operation against one of these outlying areas called the City of Hawija (Translation is, according to wiki: "Wild Carrot"). Two battalions would advance in two separate columns and form a cordon around the city. Then further smaller cordons would be set up inside the city and a series of intelligence led targets would be assaulted to clear out the pockets of insurgents, and hopefully capture a few escaped high-ranking Ba'ath officials. One such target that was suspected to be in the area was Izzat Ibrahim al-Douri, whom to this day still hasn't been captured. 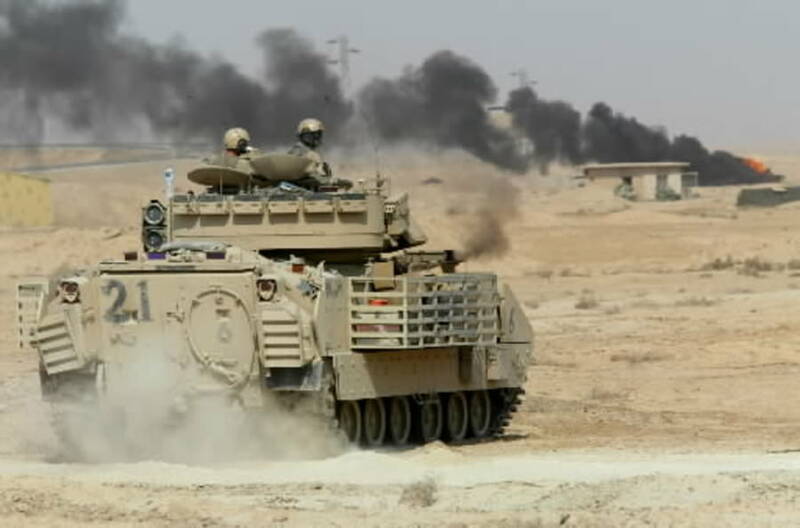 For armoured support was provided, it was to consist of a platoon each of M1A1 Abrams, M2 Bradley's and M1064 mortar carrier's with 120mm mortars. This team would remain in a central location equidistant from each infantry battalion, and should either force run into difficulties it could call upon the fire-power of this mobile column. Leading this support team, was a scout platoon, consisting of ten Humvee's. This was back in 2003, so the protection for these was minimal. The weapons fitted were evenly split between M2 .50 calibre machine guns and Mk-19 40mm grenade launchers. The scout platoon was to proceed the attack, scout the main line of march for the armoured team and then secure their forward assembly area, where the armour would wait until it was called into action. The scout platoon set off at 2000 on May the 19th, and would be the first US units to approach the enemy held area. As they travelled down the main road they kept their lights on and were driving normally as the main road was often used by civilians however, ominously, tonight there was absolutely no traffic on the road. For this reason the night vision gear wasn't switched on in case it got burned out by all the ambient light. Even so the street lights were all on as normal. The plan was to reach a rally point, some six kilometres from the planned assembly point then switch lights off and proceed cross country. 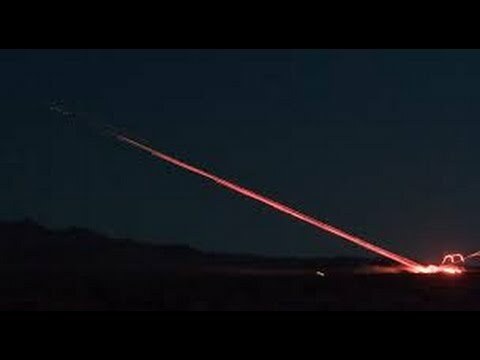 The impending sense of trouble continued as every few kilometres a spray of tracer fire would mark the sky, as Iraqi observation posts would signal the scout platoon's progress to their allies. Due to intelligence estimates that there would be little or no enemy action it was decided to not establish a radio link site. Radios often have limited range which can lead to scouting forces becoming disconnected from their parent units. In World War Two for example, it was often the case where a couple of tanks from an armoured unit would be detailed to be the "rear link" vehicle and would thus ensure the forward units transmissions. In the modern US army such a role is called a "Retrans" location. As expected the scout platoon was out of contact after about 30 minutes. When the scout platoon reached its rally point, the location where it was to switch off its lights and continue across country, the commander saw a small settlement some distance away that had sent up warning tracer fire. He ordered his platoon to advance a bit closer, moving some 2 km, to assess the likelihood of a threat from this location. About 2100 the scout platoon crossed a ravine with an embankment via a bridge and halted, the vehicles pulled into a standard herringbone formation and prepared their night vision equipment. Due to the location, the commander set up a hasty roadblock to secure the area for the ten or so minutes he expected to be in the area. Shortly afterwards the street lights were cut plunging the scout platoon into total darkness. Over the next eight minutes these roadblocks stopped and halted five vehicles, loaded with men and an array of ordnance including machine guns and RPG's. One of the vehicles was filled with men wearing webbing. When stopping one of the vehicles, an Arab in the back was waving a white flag he'd improvised from his Keffiyeh, all the time keeping his other hand out of sight. This tense situation was broken when the platoon commander fired a single round past his ear at a distance of about two inches, which promptly caused the man to surrender. All the men were detained, due to suspicions about their motives. By this point the scout platoon had some twelve prisoners, and was unable to continue its mission. The commander decided to await the follow-on forces, by holding their position, and then hand the prisoners over before continuing. The prisoners were in a holding area outside the perimeter formed by the vehicles. 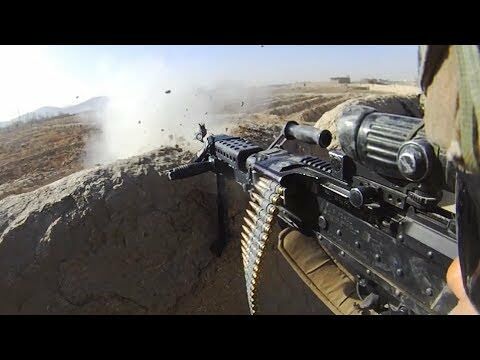 At this point a barrage of small arms fire came flying out of the desert. 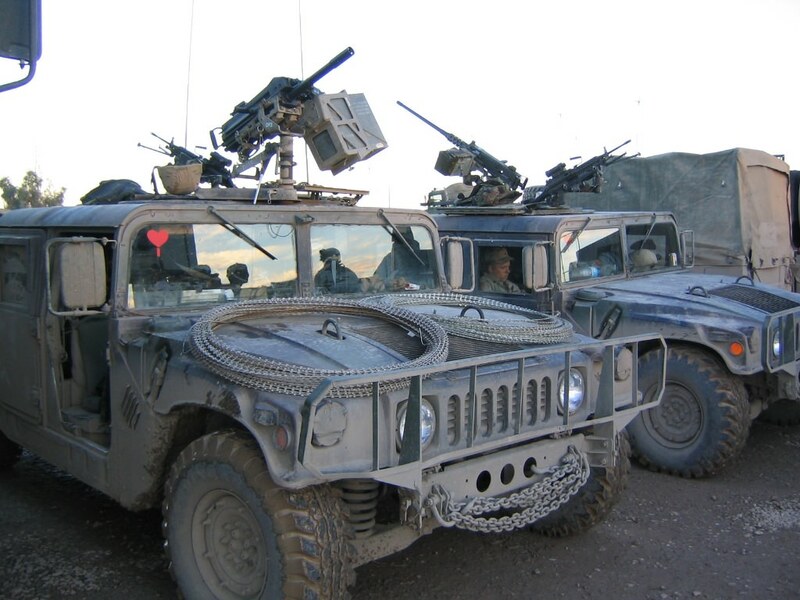 After a brief exchange one of the gunners on the Humvee's reported he could see six enemies through his night vision, and he was given permission to fire. Two other Humvee gunners were told to watch the first gunners fall of shot then engage the same area with their .50 calibre machine guns. After another thirty second or so of fire flashing back and forth one of the US gunners fell forward out of his Humvee and slid down the front of the vehicle after being hit in the torso. As he lay in sight of the enemy he was quickly dragged behind cover and given first aid. For the next ten minutes or so the three heavy machine guns would keep up a running fight with the six enemy infantry. Then reports came in of more trucks dropping off men at another two locations, further enemy personnel were moving towards the scout platoons position from a nearby mosque and cluster of buildings. The latter groups of enemies were trying to flank the scouts position. Soon everyone was firing at targets. Suddenly the senior NCO ran along the line of vehicles gathering up the drivers, and told them to bring their vehicles M240 machine guns. The NCO had spotted a group of enemies trying to get into the ravine, where they could have moved with impunity to the embankment and enfiladed the scouts position. They managed to establish a gun line with five M240's which checked the movement of the enemy. By now the fire fight had been going on for some twenty minutes, and the US soldiers were running low on ammunition with a persistent enemy pressuring them. There were also reports of enemies bringing up technicals (pick-ups with mounted weapons on the back). One of the night sights fitted to the Humvee's heavy weapons had been hit square in the lens by enemy fire. That's when the radio squawked to life. The armoured support team was some 10km away, could see the fire-fight and the tanks were in the lead charging down the road at best speed using their normal white lights to aid their movements. Furthermore, there was an A-10 overhead. The scout platoon commander passed the information on that anything or anyone south of their position was hostile (the prisoners were held to the north), the A-10 pilot identified several targets and made a pass, loosing off a seven second burst from his 30mm cannon. This caused the enemy to break contact, and the scout platoon was saved. The operation didn't end there though. The tank platoon roared through the scouts position, and actually missed them in the darkness, it halted about 1km further down the road. The Bradley's arrived and orientated to face the north, not the enemy to the south, which caused some confusion until the scout platoon leader got them turned around. They then dismounted and covered by the Bradly's 25mm's, cleared the mosque and nearby buildings after the M2's destroyed two enemy technicals. There they found several more weapon dumps, and a tripod mounted FN-MAG machine gun that had been laying some very accurate fire onto the scouts during the engagement. The one US casualty got evacuated and survived his wounds.